Leak Repair Vallejo, CA | A+ Waterworks, Inc. Managing your home or commercial buildings includes inspecting areas that might need leak repair. Vallejo, CA residents and business owners understand the damages and consequences that unchecked leaks can cause. To ensure that your home or building won’t be the site of preventable accidents, turn to professionals for leak repair. Searching for methods on how to do leak repair in Vallejo, CA homes or buildings is a good move if you want to keep your property in excellent condition. However, going the DIY route is not a good idea if you want superb results. When it comes to leak repair service in Vallejo, CA, it is better to leave all the work to experts like A+ Waterworks. A+ Waterworks is a full-service plumbing company that provides the quality leak repair Vallejo, CA home and business owners need. Established in 1994, our plumbing company specializes in a variety of residential and commercial services. Our skilled team takes on every project with precision and accuracy. We pride ourselves on our exemplary work, fast response, and commitment to satisfying our clients. To ensure proper leak repair for Vallejo, CA homes and establishments, hiring an experienced plumber to do the job is the best choice. Higher chances of indoor flooding and destruction of walls and foundations are likely to be caused by unchecked leaks or shabby fixtures. With professional leak repair in Vallejo, CA, you won’t have to stress about those things. A faulty and broken pipe can potentially allow dirt and other waste to mix in with the water you use. Professional leak repair for Vallejo, CA residential and commercial properties can keep this from happening. Hiring experienced plumbers, like the ones from our company, to do leak repair in Vallejo, CA allows you to protect your family, employees, or customers and keep them from contracting infections and other diseases. Indoor puddles that seem to increase in volume can cause you a lot of stress. With leak repair in Vallejo, CA, the time you spend trying to fix broken plumbing fixtures becomes shorter. When you let A+ Waterworks perform leak repair in Vallejo, CA, the issue can be addressed immediately before it escalates and becomes a disaster. A skilled plumber can easily spot which areas are in need of water leak service repair. Vallejo, CA homeowners and businessmen won’t have to worry about any extensive digging work being done on their property. As professionals in leak repair in Vallejo, CA, we at A+ Waterworks will always deliver fast and efficient services, including leak detections. Some residential and commercial owners either dismiss minor leak problems or attempt to fix those issues themselves. Experts at leak repair in Vallejo, CA can address the issue precisely. A trusted service provider of leak repair in Vallejo, CA, A+ Waterworks will handle the problem immediately. A piece of real estate is one of the biggest, most important assets we can acquire. Any repair or modification made to it should be of the highest quality to ensure the security of our finances. When it comes to professional plumbing, fire system installation, and sanitation services for residential and commercial clients, turn to A+ Waterworks. We have been serving the North Bay area of California since 1994 and have been hailed as one of the best in the industry. Our services are available to clients 24 hours a day, seven days a week. Whether it’s a small leak in your sink at 2 in the morning, or a total overhaul of your plumbing system at a scheduled time, A+ Waterworks is ready to give you A+ service! A+ Waterworks is a locally owned and operated plumbing, fire system installation, and sanitation service company. We treat every client like they’re family and do everything we can to understand their situation. At the core of our services is empathy and passion. A+ Waterworks is a full-service plumbing company known for quality and integrity. What sets us apart from the rest is our versatility, commitment, and quick response time. We are dedicated to our clients and go the extra mile to solve all their plumbing needs using our array of techniques. 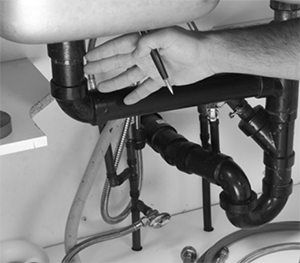 We specialize in a variety of residential and commercial plumbing services, and never sacrifice quality for quantity. From fixing minor leaks in houses to maintaining the plumbing system of an industrial warehouse facility, our plumbers will allot the same amount of care and attention to every project we do. A+ Waterworks looks forward to creating long-term relationships with every client by ensuring customer satisfaction with every plumbing order. According to the NFPA, having fire sprinklers in your home or establishment will greatly increase your chances of survival during a fire. Fire sprinklers are one of the best fire prevention methods since they are quick-acting devices. A+ Waterworks has licensed sprinkler fitters who have years of industry experience. Our team has installed fire sprinklers for warehouse facilities, multifamily housings, hotels, office buildings, and small residences. The professional installation and repair services we offer are available at reasonable rates. Drains will clog over time. The accumulation of soap, hair, grease, and dirt builds up on the walls of the pipes, causing blockages in kitchens, bathrooms, and sinks, among other areas. Blocked drains are inconvenient, unsanitary, and simply disgusting. Not only do they emit an intolerable odor, but they may also cause potential harm to your family once drain pipes break. When regular drain cleaning is not enough to solve the problem, turn to A+ Waterworks! The A+ Waterworks team has decades of industry experience in residential and commercial sewer cleaning. Our sanitation experts will do everything to determine the cause of the blockages. From there, we’ll use the information we get to plan and implement actions that prevent these blocks from happening again. Efficient plumbing, drainage, and fire prevention systems are very important in securing your property. Whether you’re a humble owner of a small house or a proud entrepreneur running a large factory, these systems are indispensible. As such, it would be very beneficial to learn updated facts about them. For more information about proper plumbing, fire prevention, and drainage, visit our resources page. After learning about the importance of our services, it’s time to get in touch! We serve all residential and commercial clients in North Bay, CA. Our office hours are from 8:30 A.M. to 5:00 P.M., but emergency services are available 24/7. You can easily call us at 707-255-6150, or drop by our office located at 194 Camino Oruga, Ste. 13, Napa, CA. Similarly, you can send us an email at [email protected] or by using the inquiry form located on our contact page. Visit our website for more information about our services. We look forward to hearing from you!